Draw a single closed loop which does not cross or touch itself. 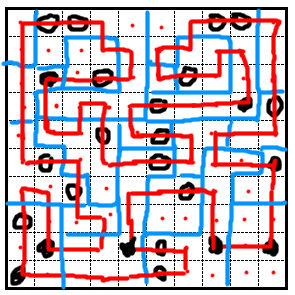 The sections of the loop run horizontally or vertically between the center points of orthogonally adjacent cells. The loop must visit all cells with a white or a black circle but not necessarily all other cells. In a cell with a black circle the loop must turn by 90° and must travel straight through the previous and next cell. In a cell with a white circle the loop must travel straight through and must turn by 90° on the previous or the next cell. Oh dear, I must have dropped and broken it. I'm sure you can still figure it out. A few rules for putting it back together. None of the pieces may be rotated, and no two pieces may overlap. 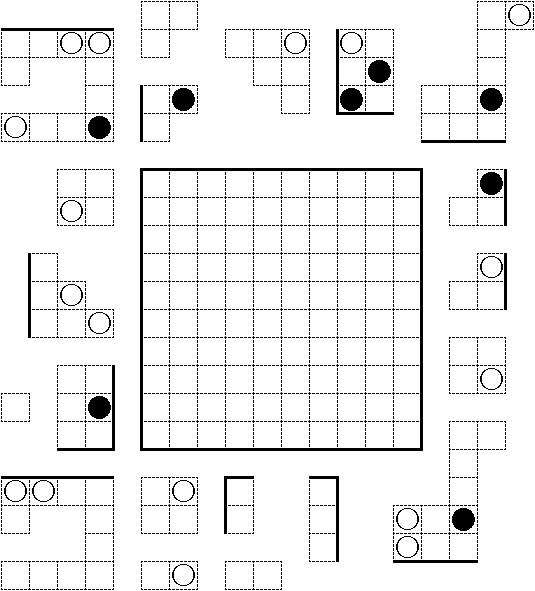 The thick borders on the pieces must coincide with the perimeter of the grid. Not the answer you're looking for? Browse other questions tagged grid-deduction jigsaw-puzzle or ask your own question.